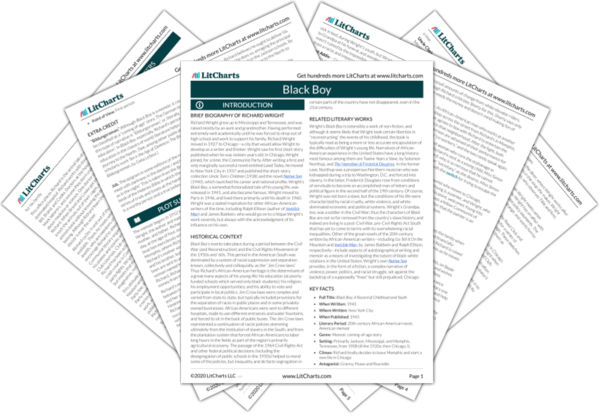 Instant downloads of all 946 LitChart PDFs (including Black Boy). 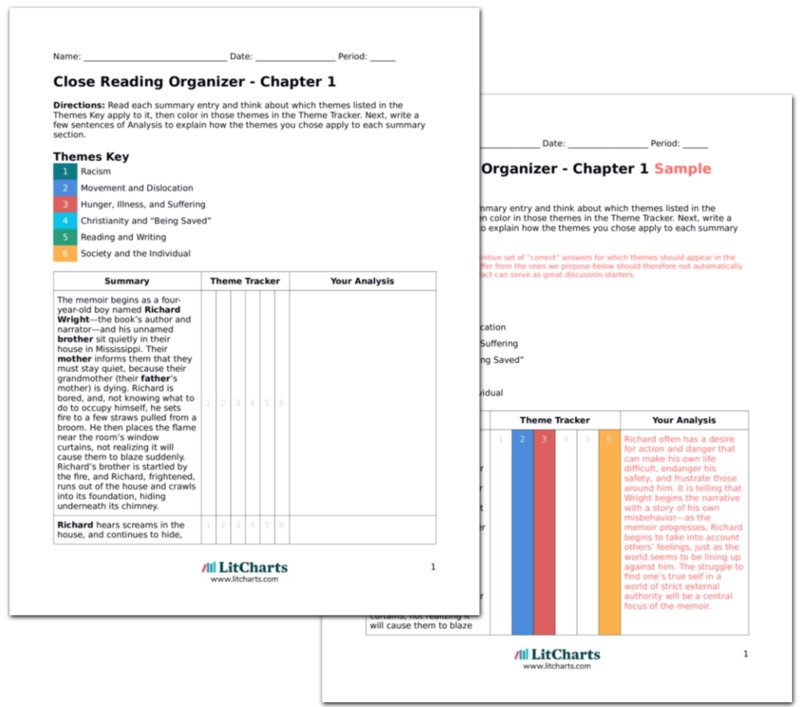 LitCharts assigns a color and icon to each theme in Black Boy, which you can use to track the themes throughout the work. It is 1925, and Richard is 17, looking for full-time employment year-round. He takes a position as an assistant at a clothing store, owned by a white family, which sells clothing to African Americans “on credit.” One day Richard observes that the white family brings a black woman into the shop and beats her in the back, because she has not yet paid her bills. Richard becomes even more attuned to the cruelties white people inflict openly on black people in Jackson. Another day, Richard is making deliveries on a bicycle when he is picked up by a few white boys in a truck, who offer to give him a ride and appear to be nice to Richard. But when they offer him a drink and he declines without calling the boys “sir,” the boys throw a bottle at his face, causing him to bleed, and leave him behind, saying Richard should “be more careful” around whites, otherwise he could be killed. These white boys paradoxically think they are being “kind” to Richard by stating that, if Richard would have been picked up by any other boys, he would have surely been beaten or even killed. But Richard recognizes that these white boys are no better than other, more violent groups. The danger of growing up in the segregated, Jim Crow South is not always the immediate danger of physical destruction; it is also the much more unnerving idea that, at any moment, an African American can make a mistake that could cost him his life. Richard cannot stand living this way, in constant fear. Another evening when is making deliveries on his bike Richard is pulled over by a white cop—the cop tells Richard to tell his boss not to send him on errands “in white neighborhoods at night.” Finally, Richard’s white boss calls him in and asks why Richard doesn’t “joke and laugh” like the other black employees. When Richard responds that “there isn’t much to smile about,” the man fires him, afraid of and angered by his “impudent” attitude toward white authority. Here, Richard has not done anything wrong—in fact, he is simply doing his job, making a delivery in a white part of town. But the police also participate in the de facto separation of whites and blacks, making Richard feel that he is not welcome even to ride through a neighborhood inhabited by white families. Richard tries to hold down a series of similar jobs, working for whites in Jackson, but he is let go for his “rudeness,” his inability to appear jovial when barked at by white authority. Richard asks his friend Griggs, a former school classmate, if Griggs can find him a job, and Griggs replies that he might be able to, but that Richard must learn to get out of white people’s way in public, to appear always deferential to them, and to call them sir. After a few days, Griggs says he can set up an appointment soon with a northerner named Crane, who runs an optometrist shop and needs an African American assistant—Griggs stresses that, although Crane will be relatively kind to African Americans, Richard must be well-behaved and deferential. Griggs’ character is the closest to what might be called an “Uncle Tom” figure, or one who, as in Stowe’s novel, attempts to put on a façade of cheerfulness in front of white society, in order to gain their favor. But Griggs is more practical than Stowe's Uncle Tom—he believes that, in order to survive in the South, an African American man must absolutely behave diplomatically toward white authority. It is not an issue of ideals, but rather of tactics; Griggs wants to make sure he can continue earning money, supporting himself, and protecting himself and his family, and is willing to betray his own dignity to do so. Griggs tells Richard, after several more days have passed, that he has arranged the job with Crane, and that Richard will be paid five dollars a week—for Richard, a large sum. Richard meets with Crane, who seems reasonably polite, and Crane introduces Richard to the two white assistants who grind the lenses, Pease and Reynolds. Richard is tasked with keeping the shop tidy and running errands. Richard believes he has had a stroke of good luck, and that, because Crane is a northerner, he might be more willing to explain to Richard the ins and outs of the optometry trade. These high hopes later lead to the feeling of total despair, on Richard’s forced withdrawal from the job. 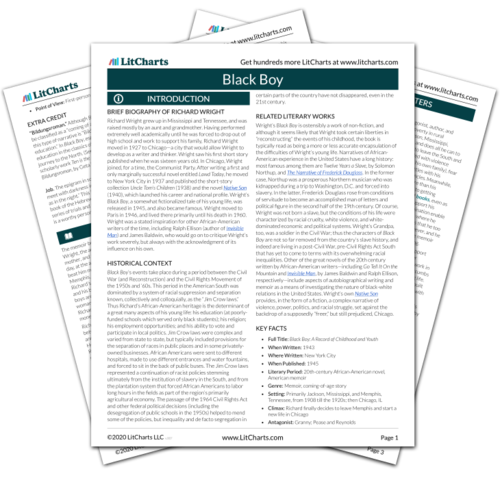 Get the entire Black Boy LitChart as a printable PDF. Although Crane tells Richard that he will learn about optometry from the white employees, Pease and Reynolds do not teach Richard, and when Richard asks each about their work grinding lenses, they only reply that African Americans should not learn such things, and that Richard “is trying to be white.” One afternoon, Reynolds and Pease corner Richard while Crane is out of the office, and accuse him of calling Pease Pease and not Mr. Pease. Richard is terrified, as both men threaten him with physical violence, and Richard says that he will quit the job, that he does not remember calling Mr. Pease “Pease,” and that he will go away peacefully. The memoir contains, in the background, a series of hints as to how African Americans are to refer to whites. Whites are always in a position of authority, therefore they are always “sir” or “madam.” And in the workplace, whites are always superior to African Americans, therefore it would be considered highly informal and irregular for Richard to call Mr. Pease “Pease.” But Pease also knows that Richard would never do this, and uses this naming “etiquette” as a means of picking a fight with Richard. Richard meets with Griggs later that day, who says Richard got a “tough break,” and Richard sneaks into the office the next morning to meet with Crane before the rest of the employees arrive. Richard tells Crane that he is afraid for his life working at the shop, and that both white men threatened him. Crane calls in Reynolds and Pease when they arrive, but Richard refuses to explain in front of them what they did to him the previous day. The two men leave, and Crane gives Richard a small severance, saying that “it must be difficult for Richard” in the south, and that perhaps it's better that Richard wants to find employment up north. Richard leaves the shop, devastated at this turn of events, since he thought this position might enable him to earn money and continue his education. Crane is a character who, though sympathetic with Richard’s situation, does little actually to help him. Instead of firing Pease and Richard and hiring two men, perhaps African Americans, who would deal more willingly with Richard, Crane instead tells Richard that his life is difficult, and does nothing to change the status quo at the shop. This was the way that Jim Crow laws allowed white authority in the South to perpetuate itself—because no single white person felt fully responsible for the horrors of that system, and therefore no white people agitated for its change. Schlegel, Chris. "Black Boy Chapter 9." LitCharts. LitCharts LLC, 18 Jun 2014. Web. 25 Apr 2019. Schlegel, Chris. "Black Boy Chapter 9." LitCharts LLC, June 18, 2014. Retrieved April 25, 2019. https://www.litcharts.com/lit/black-boy/chapter-9.